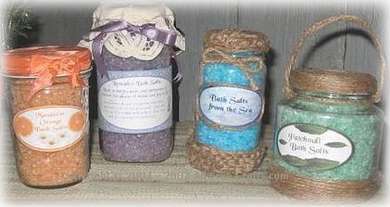 Fragrant and pretty bath salts in decorated glass jar. These four fragrant bath salts recipes are easy to make and inexpensive, yet they look like a purchased gift from an exclusive spa with our free printable jar labels. These bath salts recipes are ideal for homemade gifts in a jar, combining the soothing mineral essence of salts with aromatherapy for a tranquil at-home bathing experience. Don’t forget to pamper yourself with the fragrance that suits you best! Just follow our directions to decorate four recycled glass jars with printable labels for the front and back of each jar, like the recycled bottles shown: (left to right) Mandarin Orange Bath Salts, Lavender Bath Salts, Bath Salts from the Sea and Patchouli Bath Salts. 1. Collect glass jars, remove labels; wash and dry thoroughly. 2. For most bath salts recipes you can use either epsom salts or sea salt, or a combination of these. I used to like adding a tablespoon or so of baking soda to help soften the water, until I read about bath salt jars that exploded because of baking soda reacting with moisture inside the jar. One good mix is one cup of epsom salts, with 1/4 cup of sea salt – but a little more or less of each is usually fine. Epsom salts and sea salt are soothing for tired muscles, while both do gently soften the water for a luxurious bath experience. You could also add a tablespoon or two of finely ground regular oatmeal (not quick cooking) for silky, skin-softening water. 3. Fill jars to the top with the combination of bath salts that you plan to use. Empty salts into a mixing jar and add glycerin, if using. Add essential oil – how many drops you use is a personal preference, but start with two or three drops and see if you like the fragrance. The same goes for liquid food coloring; sometimes I use quite a few drops of food color to get strong hues, but so far it hasn’t stained the bath tub or anyone’s skin. Remember that the color and fragrance are much diluted in the bath water. Stir salts vigorously until all ingredients are thoroughly combined. I used a small canning jar for this project, with a screw top one piece lid. 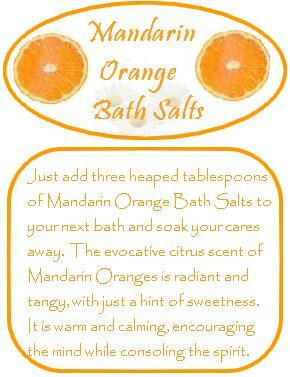 I also used only epsom salts, adding about six drops each of mandarin essential oil and orange food color. The lid is decorated with 1/2″ orange ribbon, cut in strips to cover the top. Coat the lid with tacky glue and lay the first strip across the middle of the lid and over the rim just a little on both sides. Add ribbon strips on either side, each one overlapping just a little, until the top of the lid is covered. Take another strip and glue it around the lid rim, covering the edges of the top ribbons. Overlap the ends of the lid rim strip and glue down firmly. Cover ends by making and gluing on a small bow. Screw the beribboned lid in place securely. Print the free Mandarin Orange Bath Salts Labels and glue the front label centered beneath the ribbon bow, with the other label glued to the back of the jar. I used 1 cup of epsom salts and half a cup of sea salt for this, adding about 8 drops of lavender. (This one was for me, and I adore lavender – it made the bathroom smell heavenly!) Adjust the fragrance, just adding one or two drops at a time until you’re happy with it. Lavender is difficult color to achieve with food coloring, but I got a pleasant lavender hue by using far more red than blue. Decorate the jar by threading lavender ribbon through the openings in an ecru doily, tie in place and make a bow. Alternatively, use a rubber band to secure the doily, then tie a ribbon over it. 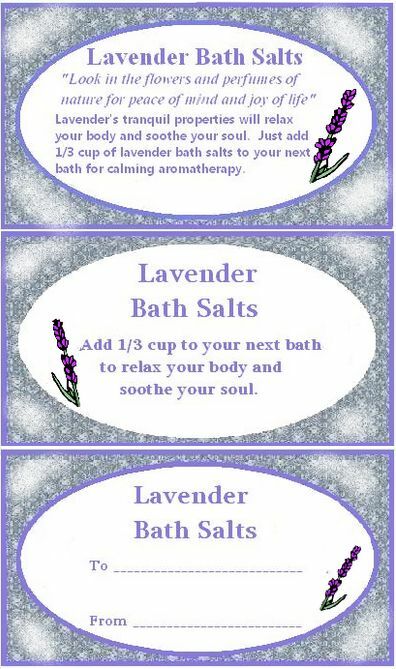 Print and cut out our free Lavender Bath Salts Labels then glue in place to finish the jar. Use only sea salt – either fine or coarse, or a combination of both, for this recipe. Add an essential oil that reminds you of the sea – I used sandlewood. A drop of eucalyptus might enhance this mixture. Jasmine would also work well. Add drops of blue food coloring, either to all the mixture, or just half, so you can funnel white and blue layers into the jar. For the nautical rope decoration, take three lengths of household twine, each about three feet long and braid them together. Coat the jar lid with tacky glue and, in the middle of the lid, start twisting the braid around itself in a spiral, pushing the flat side of the braid firmly into the glue. Go right over the lid edge and around the rim, adding extra glue at the end. Make another braid to decorate the bottom of the jar. Take this braid up the jar about an inch or so, then secure the end at the back of the jar. Print out the Bath Salts from the Sea Gift Jar Labels, coat with glue and stick firmly to the front and back of the bottle. Take a single strand of twine and glue it around the front label. Tie another single strand of twine in a bow around the neck of the bottle. Patchouli oil has a sensual woodsy aroma, valued for its tranquil calming effect and long-lasting intense fragrance. 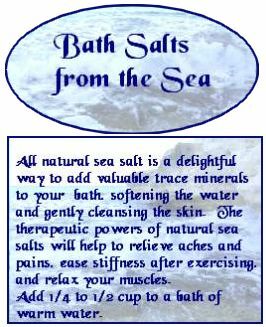 Add sparingly to epsom salts, sea salt, or a combination of both. Color bath salts green with food coloring, add glycerin, if using, and bottle. The rope decoration is simple. Just coat the jar lid with tacky glue and begin to spiral a single strand of household twine around the top and down the sides of the lid. Do the same at the bottom of the jar, bringing the twine up the jar to a depth of about an inch. You can use extra glue on top of the twine if needed to make it secure; the twine absorbs the glue, which then dries clear. Fashion a handle by tying a double strand of twine tightly around the neck of the jar, then twist the strands loosely together, looping them over the lid top, and back to the other side to knot in place. 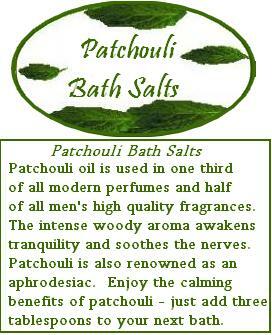 Print our Patchouli Bath Salts Gift Jar Label and glue to front and back of the jar to finish. Hi how long will these bath salts keep? Do you think peppermint or eucalyptus oil will work for this recipe? I like both those oils in my bath, along with patchouli. Sometimes though, if I add too much eucalyptus, I experience a peculiar cooling effect on my skin, even though the water is warm. These are both very powerful essential oils that can irritate sensitive skin, but I think it largely depends on your body chemistry. I love your recipes and ideas. I just wish your labels were PDF… Thanks for sharing! Thank you, Emilia. I agree with you – PDF format might be more user-friendly for many people. I’ve started using PDF files on new printables. When I have time, I would like to convert the labels on this project to PDF as well. I appreciate your feedback and practical suggestion! Thanks…I will try it out and if too strong, I will know next time…love your site!